Water can contain dirt, minerals, chemicals and other impurities that make it smell and taste bad. Some of these contaminants can endanger your health, especially when they include microscopic organisms and bacteria that can cause serious illness. Filtering water can help purify water, removing these impurities and making it safe to drink, while often improving its taste. Mechanical filters are used to remove leaves and other debris from water, along with dirt, silt and clay particles in water. Mechanical filters may be made from metal screens, fabric, ceramic or paper. These impurities, called sediment, can cause an unpleasant taste but aren't usually a health risk. 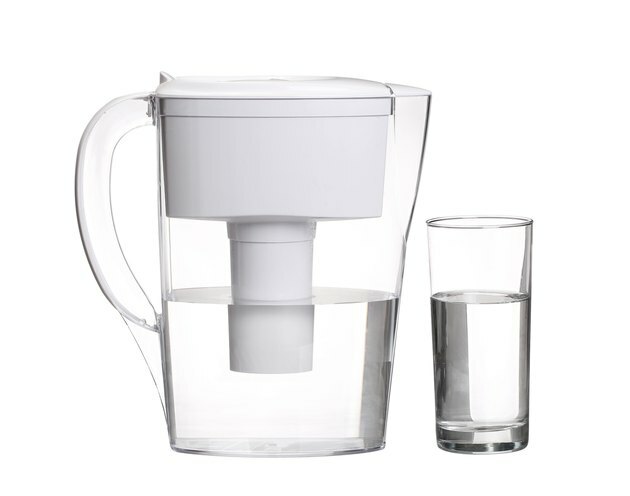 Most home water filtration units use replaceable paper filters that screen out fine sediment. Iron and other minerals, such as calcium and manganese, are not hazardous to human health, but they can cause drinking water to taste metallic or just unpleasant. Iron or manganese can cause clothing stains on when wash water contains these elements, and they can even discolor porcelain and other dishes washed in the mineral-rich water. These minerals can build up in water pipes, gradually clogging them and reducing water pressure, possibly causing plumbing problems. Filtering water is essential to keep harmful bacteria and parasites from drinking water. Giardiasis is a type of illness that causes diarrhea and can last as long as six weeks. The microscopic parasite that causes the disease is Giardia intenstinalis, an organism that can survive in the environment for many months. It can be ingested from water that has become contaminated with animal or human feces. Another parasite that can cause similar symptoms is cryptosporidium. Cryptosporidium is resistant to chlorine and must be filtered out with mechanical filters. These pathogens are effectively removed by passing water through filters listed as micro-, ultra- and nano-filters. Most municipal water utility companies use chlorine to treat drinking water because it's inexpensive, easy to use and highly effective at killing many of the bacteria found in water. It can also eliminate some viruses. While it's a good disinfectant, chlorine can make drinking water smell and taste unpleasant, and it can also react with some metals to form hazardous compounds. An activated carbon filter removes the chlorine smell and taste from water. Lead is toxic when ingested, and it’s essential to remove it from drinking water. Lead commonly gets into drinking water when it seeps into the water supply from old plumbing pipes or the solder used to join them together. It can be removed from water through reverse osmosis filters, distillation and carbon filters designed specifically to remove the metal. If you rely on well water, health agencies recommend that you have your well tested at least once a year for lead and other contaminants. Before the 1940s most common pesticides contained heavy metals that did not readily dissolve in water, but today pesticide residue in drinking water may be on the rise because modern organic pesticides dissolve in water and can easily get into the water supply. Activated carbon filters can remove pesticides and volatile organic compounds from drinking water.